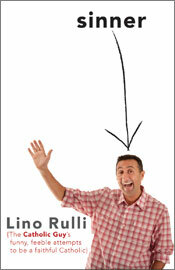 I think I should point out before you get too far into this review that I am a huge fan of Lino Rulli, host of The Catholic Guy Show on Sirius/XM Satellite Radio. I even pre-ordered his back several months before it was due out. That being said, I think anyone who is a fan of Lino doesn't have a problem cracking on him if the need arises or the opportunity presents itself. So, I think you can trust my opinion about his book, Sinner. "Sinner" is an autobiography about Lino's life growing up in Minnesota. It doesn't always present Lino in a positive light, which may surprise anyone who has not heard his show and expects The Catholic Guy's autobiography to me the next Story of a Soul. That is the reason for the title and what he is trying to convey through out the book. He is a sinner. He is trying his best to be pleasing to God but he is human and has human faults. He tries. He fails. But he doesn't quit. He gets back on the horse and tries again. One of the things that I enjoyed about the book is the tendency to tell a story and then comment on it in regard to the spiritual life. He does this on the show quiet regularly and I always enjoy it when he does. After all, we aren't just physical beings and everything we do in this life has a spiritual side to it too. We don't think like that necessarily, but most of our physical acts we do every day has some sort of spiritual connection or repercussion even. If you are looking for some deep, confusing, theological book then this probably isn't the one for you. But if you are looking for something light, but that makes you think about your own spiritual life and how you are a sinner too then this is the one for you. Sinner can be found at Amazon and Barnes and Noble or most Catholic book stores. .